Do you believe, as we do, that just dining solo shouldn't mean skimping on deliciousness? Good. We hereby dedicate this Pronto Nacho Salad to you. 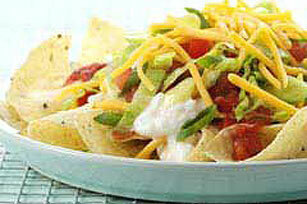 Layer chips, cottage cheese, salsa, lettuce, tomato and onion on serving plate. Sprinkle with cheddar cheese. Prepare as directed, substituting KRAFT Shredded Sharp Cheddar Cheese for KRAFT Shredded Reduced Fat Mild Cheddar Cheese.